Greetings, AHRA! I recently attended the 2018 AHRA Annual Meeting and Exposition in Orlando. This was my first time attending an AHRA conference, and it was made possible through the Osborn Scholarship awarded to me by the AHRA Education Foundation. I began my career 29 years ago at Indiana University Health Bloomington Hospital, where for the last five years I have served as the director of cardiac testing/pulmonary and diagnostic imaging services. Recently, I assumed an interim role as the service line leader for oncology in our region of four hospitals, covering 11 counties. I joined the AHRA at the beginning of the year and applied to take the CRA exam. The CRA application was accepted, and my interest in the conference was primarily to attend the CRA Exam Workshop. While leadership has been my primary role in healthcare for the past 18 years, my clinical background began as a registered respiratory therapist. Having learned so much in the field of radiology, I was excited to be accepted to take the exam later this year in November. Following the CRA workshop, my knowledge was expanded through the rest of the week by learning from the basic management track, breakout sessions, and vendor representatives. I have attended other national conferences, but have never enjoyed them as much as I did here, thanks to the caliber of the keynote speakers. Each speaker’s content allowed me to reflect about myself in a different way, as well as to reflect about others around me. Kevin Brown, with the challenge of creating a culture of heroes, spoke about the opportunity we have to take one experience and expand it into a system to improve a problem. Colette Carlson took what we all experience and think about each day and formed it into a way to impact those around us. Todd Henry’s exchange on being brilliant in a moment’s notice opened my mind to an active way of thinking about creativity and innovation, so much so that I ordered his book on CD for my two hour trip each day to and from work. Many pearls of wisdom shared by these excellent speakers will stay with me as I grow as a leader. There were so many personal connections to make throughout the conference. Whether it was in the exhibit hall, during breaks, or by talking with a speaker after a session, new insights came with each conversation, both affirming and adjusting some of my knowledge base in radiology. I met some terrific people while networking with my peers. While this was my first time attending the conference, it will not be my last. 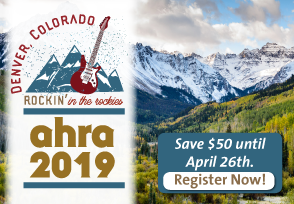 I want to encourage AHRA members everywhere to set aside their calendars now to attend next year’s conference in Denver. You may want to even consider applying for the Osborn Scholarship. Again, thank you for this opportunity to prepare, so I can perform and prevail. Theodore J. Jackson, MBA, RRT is the interim director of his region’s oncology service line and the director of cardiac testing and pulmonary/diagnostic imaging services at Indiana University Health Bloomington Hospital in Bloomington, IN. He can be reached at tjackson4@iuhealth.org. Theodore, wishing you success on achieving your CRA!!! You will do it! I’m happy to know you sat through the CRA prep sessions and hope you got what you needed!!! Congratulations on your Osborn Scholarship and for writing ✍️ your first Link article and for paying your gift forward!!! Looking forward to seeing you in Denver!